The Remo Capoeira Pandeiro is ideal for playing traditional Brazilian sambas and music from the Brazilian martial art called Capoeira. This Brazilian pandeiro is specially weighted, aiding students and professionals in minimizing fatigue. Remo's Capoeira Pandeiro is designed for today's modern playing techniques, is light in weight and features a chrome-plated triple jingle set that creates crisp sounds for fast articulated beats and unrestricted resonance. The pandeiro is constructed with a fixed, pre-tuned Skyndeep graphic drumhead with Ultratac. This new development in Remo's drumhead technologies offers enhanced sound with an attractive look. The Skyndeep with Ultratac also adds a unique animal-like texture on the drumhead surface, producing low bass notes while adding pliability, thus making it easy to bend and modulate the pitch. Also featured on this revolutionary drumhead is Remo's O-ring with adhesive that reduces overtones and increases warm bass tones. The drum shell is made with Acousticon, 100% recycled wood fiber, and is elegantly finished with an antique wood grain stain. The Capoeira pandeiro is designed with a pre-tuned low-pitch head that cannot be replaced or tuned as it is a fixed, pre-tuned head. 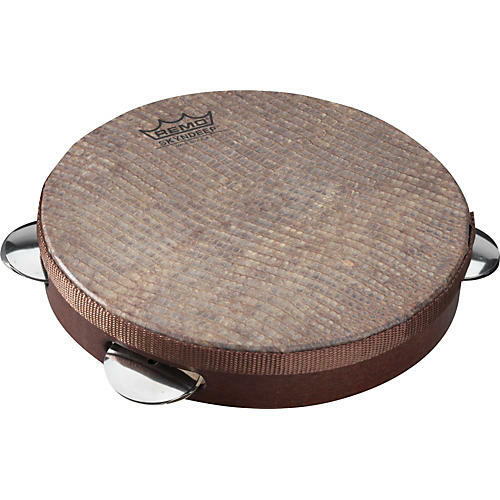 You will enjoy continuous playing as the Remo Samba Capoeira pandeiro weighs less than 1 lb.-far lighter than any other model in the market today. For further care and maintenance of your quality Remo Pandeiro, see your purchased product instructions.